The unique layout of Khmer architecture found at Vat Phou gained it the UNESCO World Heritage label in 2001 and makes it one of the highlights of any visit to Southern Laos. 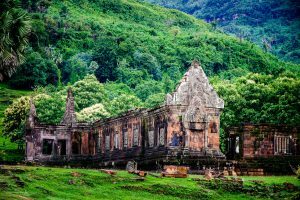 Although it is a small site compared to Angkor Wat, climbing Vat Phou’s stairs in the shade of frangipani trees, while gazing down on a beautiful landscape gives the site a mystical atmosphere and makes it a worthwhile visit. The unique layout of Khmer architecture found at Vat Phou gained it the UNESCO World Heritage label in 2001 and makes it one of the highlights of any visit to Southern Laos. 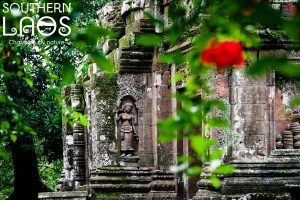 Although it is a small site compared to Angkor Wat, climbing Vat Phou’s stairs in the shade of frangipani trees, while gazing down on a landscape of undisturbed nature and pristine forests gives the site a mystical atmosphere and makes it a worthwhile visit. Vat Phou not only represents a historic site with ancient buildings, but according to historians, is also one of the world’s best examples of the planning and engineering of a landscape that reflects the religious beliefs and economic approaches of both ancient Khmer architecture and the Hindu religion. 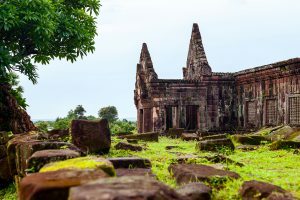 The Vat Phou temple complex is the cultural heart of a wider historical landscape on the plains of Champasak, ranging from the Mekong River to the Phou Kao Mountains. 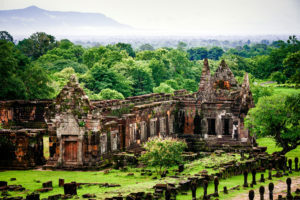 Temples, water channels, tanks, quarries, field systems, settlement sites, and the ancient road to Angkor Wat are other remains that have been found in the area. 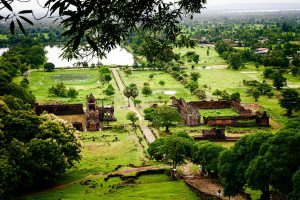 Successive Khmer rulers and kings never forgot their origins and the importance of Vat Phou and made regular donations for maintenance. Later, Vat Phou became an active Buddhist sanctuary and remains so to this day. Every year, a pilgrimage takes place during the full moon in February and attracts many worshippers. It is known today as the Vat Phou Festival and is the largest festival in Southern Laos, see Events section. Origin: Inscriptions from the 5th and 6th century mention that a sanctuary was built on the hill. This building was later replaced by the religious temple complex we can see today and was established by the Khmer Empire which dominated the region from the 10th to 14th century. Unique feature: The Vat Phou complex represents an outstanding testimony of a symbolic landscape of great spiritual significance embedded in stunning natural surroundings and expressing the Hindu vision of the relationship between nature and humanity. 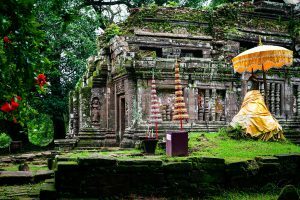 At the entrance to Vat Phou, there is a building with a museum containing a collection of objects, sculptures and architectural artefacts related to the temple. There is an entrance fee of 50,000 kip per person for foreigners and 20,000 Kip for Lao people (06/2017), and restrooms can be found in the building. There is a small restaurant near the entrance of the site and small local stalls selling water and soft drinks at the top of the site as well as local restaurants outside the complex. 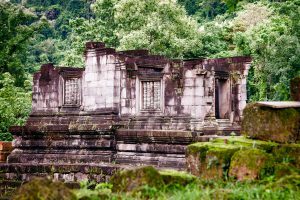 Vat Phou is located about 10km from Champasak town, where you can rent a tuk tuk, motorbike or bicycle to get to the temple, or you can join an organized tour. 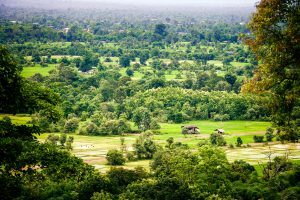 You can also get there by renting a car or motorbike or joining an organised tour in Pakse, located about 45km away from Vat Phou. 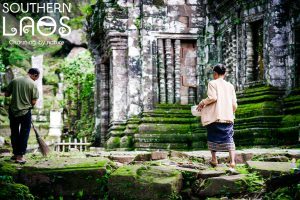 Some temples, particularly Vat Phou, have very steep steps that can be difficult to climb so take care. It is also important to observe cultural traditions and dress modestly in clothing covering shoulders and knees when visiting all Lao temples.